Leslie is a Certified Athletic Trainer (ATC) and a Physical Therapist Assistant. Leslie is currently completing a PTA Traineeship while she prepares to take her PTA licensure exam. As a Physical Therapist Assistant, Leslie delivers physical therapy services under the supervision of a PT. Leslie also uses her advanced knowledge and skills as an Athletic Trainer to assist with the progression of patients. From 2011 through June 2016, Leslie was the Head Athletic Trainer for Halifax County High School, where she supported all boys and girls sports including football, soccer, baseball and softball. Leslie graduated with in Associate in Applied Science in Physical Therapy from Kent State University in August 2016. Leslie also holds a Bachelor of Science in Exercise and Sport Science and a Master of Science in Athletic Training (MSAT) degree from the University of North Carolina at Greensboro (UNCG) in Greensboro, North Carolina. Leslie’s training included clinical rotations with the UNCG Women’s Tennis team; the UNCG Baseball team; Northern Guilford High School; and UNCG Athletic Summer Camps. She also worked in the office of the UNCG Rehabilitation Coordinator, where she designed and implemented short and long term rehabilitation plans for multiple UNCG athletes and general population patients. While a student at UNCG, Leslie volunteered with various community athletic events and served as the Fundraising chair for Athletic Training Education Program. She was also a Teaching Assistant for an undergraduate course in Kinesiology undergraduate course. 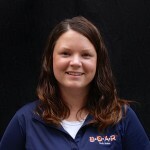 Prior to joining the team at DOAR in 2011, Leslie was a supervisor at Omega Sports Incorporated in Greensboro, North Carolina. Outside of work, Leslie stays active enjoying the outdoors with her husband, Drew, and their two dogs.